UAE trashed Nepal by 7 wickets in the Sheikh Zayed Cricket Stadium today. Losing the toss, Nepal forced to bat first on a lovely batting track. Nepal started their inning on a steady way with Gyanendra Malla and debutant Dilip Nath. Nepal lost their first wicket in 15th over on the score of 43 when they lost Dilip Nath for his 16 runs. 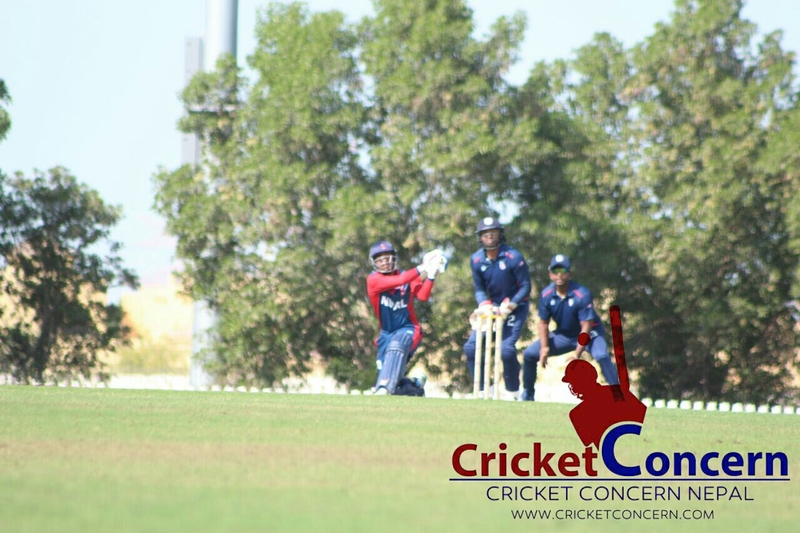 Nepal moved on and succeed to post a decent target of 222 runs with the lose of 6 wicket on Sheikh Zayed flat track. Sharad Vesawkar scored unbeaten 81 runs off 95 balls and Gyanedra Malla scored 54 runs off 83 balls. Late fire from Sompal Kami and Basant Regmi helped Nepal to finished the things off on positive vibes. Sompal and Basant scored 20 and 14 runs respectively. For UAE Zahoor Khan took maximum two wickets. Ahmed Raza was exceptionally well today and finished with the figure of (10-0-22-1). He expenses runs on the economy rate of just 2.30 on flat track. Mohhamad Naveed and Rohan Mustafa too grabbed a wicket each. In reply UAE started off the things on accelerometer. They played shot from the first ball hence put pressure on debutant Lalit Bhandari and grabbed numerous boundary. Sompal Kami too looks innocent on the another side with pitch not giving too many offers to him. UAE go on and passed 40s on the 6th over itself. UAE lost their scoring pace in middle over but they managed to passed the target quite easily in 45.5 overs with 25 balls remaining. Shabbir unbeaten 81 runs and Rohan Mustafa 62 runs innings make the chase more easy for the host. For Nepal Sandeep Lamichhane and Sharad Vesawkar took a wicket each where it wasn’t a good day in office for rest of the bowlers. Few wrong field placement and dropped catch make the things for easy for UAE. Nepal and UAE will face each other once again on 8th of December in same venue as their last match of ICC WCCL 2015-17.